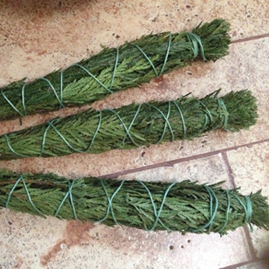 Cedar Smudge Sticks are used for clearing energy. 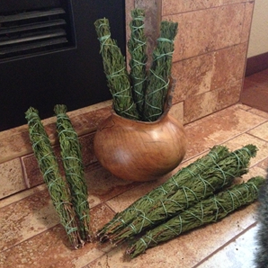 To use these smudge sticks place them in a heavy bowl or conch shell and light the end allowing a small flame to catch and then blow it out. This smoke can be used to clear your auric field and your house. The spirit of the Cedar is sacred and must be respected each time you use it. Give thanks to the Cedar before you burn it. Give thanks to the Fire before you light it. Make sure you put the cedar out completely before leaving the room. The Cedar stick is not incense. Sonja Grace Inc. is not responsible for any accidents or misuse of this product.